Gently Used with No Nicks, Chips, Cracks or Stains. Used: An item that has been previously used. The item may have some signs of cosmetic wear, but is fully operational and functions as intended. This item may be a floor model or store return that has been used. 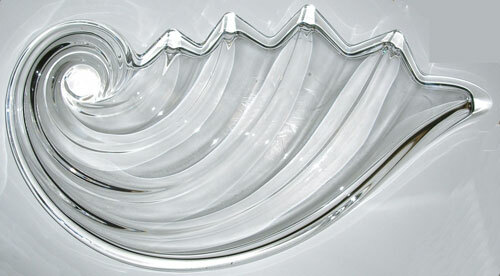 This Stunning Glass Plattet is in the Shape of a Nautilus Shell. Makes Such an Elegant & Organic Presentation. Bring the Beach to Your Table & Entertain with Style! Adds Radiance to Your Place Settings & Brilliantly Showcases Your Culinary Creations. Makes a Spectacular Addition to Anyone's Glass Collection. Shipped FAST with Domestic Tracking!